This is a label for an organization and is designed to give you more flexibility in identifying organizations based on the function of the organization itself. New databases will not have any organization types, because org types will be different for each church and some churches may not use them. Your TouchPoint Admin can create these for your church. 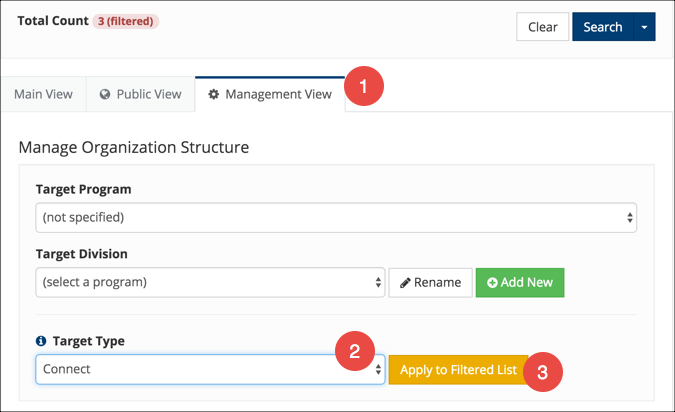 The org type is a filter on the Organizations > Search / Manage page and each organization will display its org type in the header of the organization. Search Builder also allows you to search based on org type. Think about how you will use this feature before you start creating the organization types. You may not need them. However, churches with a lot of organizations could greatly benefit from this. If your church wants every member to be part of a Bible study type of class, and serve in some capacity, for example, the org types will help you identify those that are involved in the types of activities you expect for an active member. You create a saved search in Search Builder using one of the org types, and make it a Status Flag search to see at a glance those involved in a specific type of org. You must have Admin role in order to do this. Go to Administration > Set Up > Lookup Codes and select Organization Type . It is in the section named Organizations. Click the green +Add Organization Type button. Then enter a numerical ID (10, for example) and click the blue Submit button. The page will scroll to the new Type. Click in the Code column where you see empty and enter a short code using letters (VOL, for example). Click the check mark in the blue box to save it. This is used mostly behind the scenes. The Description is what will display in Search Builder, on the org and in the filters. Then click in the Description column and enter the text you want displayed as the type (Volunteer, for example). Click the check mark in the blue box to save it. Repeat the process for each org type you want to create, and then assign the org types to the appropriate organizations. You must have Edit role in order to do this. Go to the individual organization and click Edit in the organization header. Select the Org Type from the drop-down, and then click Save Changes . You must have Org Tagger role in order to do this. Go to Organizations > Search/Manage page and filter for the orgs for which you want to select an org type. Then select the Management View tab. Select the appropriate Org Type from the drop-down list. Click Apply to Filtered List , and then click Yes, apply changes . This will set (or change) the org type for all orgs displaying in your filtered list.